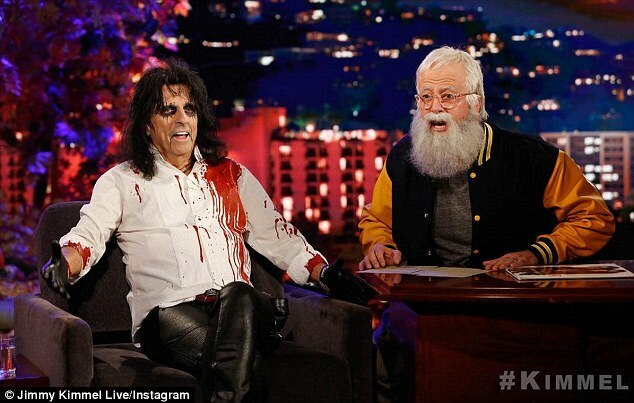 Foo Fighters frontman Dave Grohl was the guest-host for the October 31st edition of "Jimmy Kimmel Live", he completely nailed the Halloween theme - by showing up in a terrifyingly accurate David Letterman costume. After delivering a monologue and introducing freakish Halloween characters, Grohl welcomed Kristen Bell to the stage for an interview. Bell, channeling Magnum P.I., went from the dulcet melody of "Snowman" to a rip-roaring, head-banger rendition. But anyway, what did you think of "Enter Snowman"? The Frozen song got a heavy metal makeover that kept getting heavier as Kristen Bell morphed her voice from angelic singing into the familiar bark of Metallica's James Hetfield. Grohl jumps on the drums and the whole thing tumbles into Metallica's classic "Enter Sandman". Move over, Jimmy Kimmel-there's a new host in town. Introducing the Foo Fighters for that performance, Letterman said "my favorite band playing my favorite song". Dave Grohl didn't stop the collaborations with just Kristen Bell. After that, Grohl interviewed shock rocker Alice Cooper, who talked about his post-rehab experience with Joe Perry in manager Shep Gordon's haunted house, meeting Colonel Sanders and clearing up the chicken-killing legend, and the pre-show rituals of Peter Frampton and Roger Daltrey. The rest of the Kimmel staff dressed up as musicians from the '80s last night, when Grohl plugged Kimmel's annual Halloween candy prank.